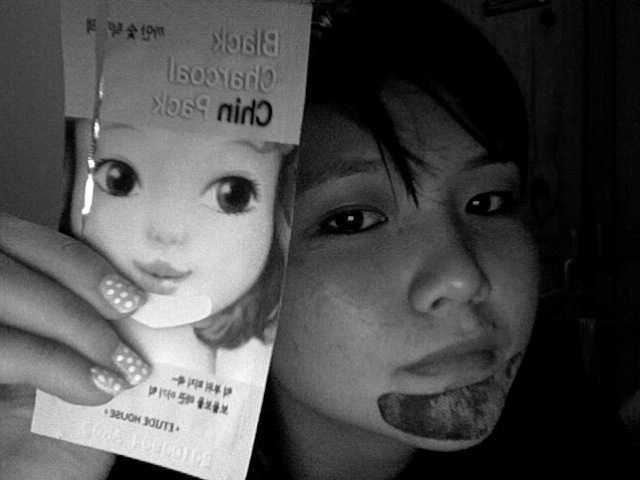 Currently at Shane's house, I bought 4 Black Charcoal Chin Packs from work (Etude House - i know, please don't laugh, it's mortifying enough.) today & stuck em' on while the boy's watching a live streaming of the Aston Villa VS Arsenal match & whining about the lousy connection. I fell in love with it the first time I purchased it. It's super effective and value-for-money. Only 90 cents per sheet! It removes all the residue from your clogged pores on your chin area & it's extremely simple to use - wet your chin, stick em' on, peel it off once it dries and TADAHHH!!! You've got yourself a clean and smooth chin! They've got the Green Tea Nose Pack too which is equally effective in removing blackheads, whiteheads etc. I bought it for Shane a few times and his nose is a whole lot cleaner now! It may be cheap, but it certainly does wonders! I highly recommend these two products if you're looking to get rid of all the unsightly residue on your chin and nose. & no, I'm not advertising for my company, it's just that after trying out this product, I think i should recommend it to whoever is out there. Besides, I'm usually frank about stuff like that cause I'm a really bad liar so you can take my word for it *insert smiley*. The stocks for these 2 products disappear from the shelves real quick though but that just proves my point isn't it? It's really good, no doubt about it. Anyway, I bought a copy of this month's CLEO magazine after a good browse of the one Noelle brought to work this morning. Absolutely love CLEO magazine cause you get like 4 mags for the price of one and this month, they've got like a Christmas gift guide PLUS Emma Watson's on the front cover of this month's issue. How not to resist? Oh and I've got pictures stored up in my camera back at home. Pictures of yesterday's day out with the boyfriend. I'll blog more about it in the next entry so...stay tuned!